Like so many others, I had been patiently awaiting the publication of the U.S. Food and Drug Administration’s (FDA’s) Unique Device Identification (UDI) proposed rules. Now that they are out I’ve been studying them and I think I will have enough to say about them that I will cover the topic in a multi-part series. Today I want to look at just one of the differences between the FDA’s proposed UDI rule for medical devices and their National Drug Code (NDC), the pharmaceutical unique identifier. The NDC structure was first conceived by the FDA back in 1969. For more about the history of the NDC see my essay “Anatomy Of The National Drug Code”. The thing I find fascinating is that at the same time they created the NDC for drugs back in 1969 they also created a comparable identifier for medical devices. They called it the National Health Related Item Code (NHRIC). Both the NDC and the NHRIC were voluntary until 1972 when the FDA made only the NDC mandatory. Because the NHRIC was not made mandatory back then it floundered and eventually was identified by the FDA as “obsolete” (see my essay “WAR: GS1 Vs. HIBCC”). Finally, exactly 40 years later, the FDA is proposing a new unique identifier for devices that they call “UDI”. This time it will apparently be mandatory for most devices. Most RxTrace readers are probably somewhat familiar with the structure and use of the NDC so I’m going to look at UDI from that perspective and point out the differences. There are a few, but in this essay I just want to talk about the difference in number assignment and registration, something that is fundamental to any unique identification scheme. I’ll cover other difference in future essays. Registration is what companies need to do to generate an identifier and start using it to refer to a specific regulated product. For an NDC, pharma manufacturers must first register with the FDA to obtain a Labeler Code. The Labeler Code is 4 or 5 digits long and it identifies the manufacturer or the repackager of a drug. Once a Labeler Code is issued to a company they are able to use it to assign NDC’s to their FDA approved products (see “Anatomy Of The National Drug Code” for a lot more detail). The FDA currently requires all packages of drugs to be identified by the NDC encoded in a linear barcode (see “Should Regulations Dictate Technology?”). Today, most manufacturers and repackages choose to comply with that rule by encoding their NDCs in GS1 Global Trade Item Number (GTIN) barcodes (see my essay “Anatomy of a GTIN”). But before they can do that they are supposed to register their FDA Labeler Code with GS1 US and obtain their FDA-compatible GS1 Company Prefix (GCP) (see my essays “Depicting An NDC Within A GTIN” and “Your GS1 Company Prefix: An Enterprise Resource”). Notice that there is no FDA requirement to use GS1 GTINs or GS1 barcodes or even to register with GS1 US. Companies simply choose to use GS1 barcodes to fulfill the FDA linear barcode requirement and that leads them down the well-established path that enables them to print the copyrighted GS1 barcode encodings and symbologies on their packages. Of course, GS1 US registration provides companies with other benefits, but I’m not covering those here. The key points here are that the FDA only assigns Labeler Codes to each manufacturer and repackager, those companies use these Labeler Codes to create NDCs, and they register those numbers with the FDA and independently with GS1 US so they can encode the NDCs in GS1 GTINs and print GS1 barcodes containing them on their packages. The problem with that is that the GTINs placed on drugs in the U.S. are U.S. specific. They are assigned in the U.S. and are primarily usable in the U.S.. Manufacturers who also sell the same drug outside the U.S. (that is, most drug manufacturers) must conform to each country’s specific numbering regulations, the FDA’s being only one of them. My friend, Bob Celeste of GS1 US likes to present this problem starkly with the following slide in his stock deck (click on the image for a better view). 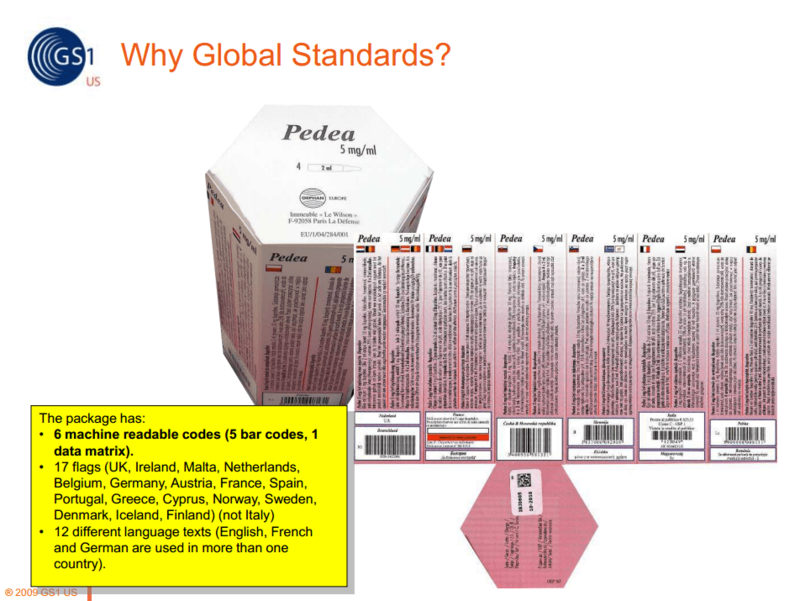 This appears to be a package of drugs sold in the European market where nearly every country has a different regulation for numbering and barcoding. This is an excellent demonstration of how global interstate commerce in the pharma supply chain is strained under the patchwork of “local” identification regulations. It introduces the potential for significant confusion at every stop in the supply chain—including at the patient interface—and that leaves the door open to errors and potentially to criminal activity (criminals love confusion). The Global Harmonization Task Force (GHTF) was formed in 1992 in an effort to address problems like these in the global medical device supply chain. The U.S. FDA was one of the founding members (as were their peer agencies in the U.K., Canada, Japan, Australia and the E.U.). One of the primary goals of the GHTF is to develop a single way of identifying medical devices that would be use globally. This is an incredibly logical but likely difficult goal and the U.S. FDA UDI proposed rule is one giant leap toward achieving it. The world doesn’t need a single human language in my opinion. Different human languages are part of the rich cultural diversity of the world. Also in my opinion, the use of a single numeric nomenclature for the same physical thing that might be used globally shouldn’t have any negative impact on cultural diversity, but it would have a big positive impact on the efficiency and accuracy of global commerce (which itself, I acknowledge, usually has a negative impact on cultural diversity, but for other reasons). So let’s all embrace it. It’s all about the number assignment and registration. A drug’s NDC is “unique” within the United States. That served us fairly well for a few decades. But if you’re going to have a single number identify a single type of object globally then the range of the uniqueness must extend globally. To do that you can’t have country-specific numbering schemes like the NDC, you need a global numbering scheme. But there isn’t any global government that can regulate devices at a global level and therefore ensure their global uniqueness. Instead, GHTF-compliant regulations like UDI mandate global third-party “issuing agencies” that can do the job. And that’s just what the FDA’s proposed UDI rule does. Rather than registering first with the FDA, a company would register with any FDA accredited “issuing agency”. An issuing agency would be “…an organization accredited by FDA to operate a system for the issuance of UDI’s”. Issuing agencies must be either non-profit organizations or an agency of a state or the federal government, including potentially the FDA itself. The issuing agencies must conform to a number of very specific International Organization for Standardization/International Electrotechnical Commission (ISO/IEC) standards for the assignment and structure of their identifiers. Perhaps not surprisingly, there are several existing organizations that operate identification schemes that already conform to that set of ISO/IEC standards, and these include GS1, the Health Industry Business Communications Council (HIBCC) and the International Council for Commonality in Blood Banking Automation (ICCBBA). The obvious assumption is that these existing non-profit organizations will all apply for FDA accreditation to become UDI issuing agencies. My assumption is that any organization that would apply for accreditation by the FDA would also apply for accreditation by all other countries who adopt GHTF-compliant regulations. Therefore, any identifier issued for a given object by any one of the issuing agencies would be unique amongst all other issuing agencies and all countries that follow the GHTF approach and that same unique identifier could then be assigned to that device by each of those governments. As other countries see the value (and the beauty) in that they are likely to adopt the GHTF approach. Once the device is assigned its UDI by the issuing agency (or, following the approach defined by the issuing agency) the company would be free to register that number with each country that has a GHTF-compliant regulation, like the FDA in the U.S. Of course, normal regulatory authority for distribution and use of each medical device within a given country would always remain with the local governmental agency, but those governments would no longer be in the number assignment business. I hope you can see that this is exactly the opposite of how the NDC number assignment works today. COULD IT WORK FOR PHARMACEUTICALS TOO? It seems to me that this approach could work for pharmaceuticals too, and any other product that is distributed in more than one country. What the GHTF started for medical devices could potentially spread to lots of products, including pharmaceuticals. Separating the assignment of a unique number from the licensing and regulation of use of a product shouldn’t have any impact on the ability of governments to regulate the product within their borders. I don’t think it would be very hard or very disruptive for the FDA to start an accreditation process for unique identifiers for drugs. GS1 US, HIBCC and ICCBBA would certainly apply and assuming they achieve accreditation all existing NDCs could be grandfathered in. From then on any new drug presented to the FDA for approval would first need to be assigned a unique identifier using one of the approaches defined by the issuing agency chosen by the manufacturer or repackager. For example, in the case of GS1 US that number would likely be a full 14-digit GTIN. Do you see any roadblocks or complications to this potential future? Leave a comment below. You’ve provided a great opening for the discussion.Thanks. Agree that harmonization is key to fulfilling the promise of AIDC in heathcare. The comments I submit personally and for association clients will so reflect. To achieve harmonization there are issues which need to be addressed. Many of these have been raised in Dental Trade Alliance neetings about the FDA UDID Pilot. Some have been discussed already with FDA. Others will be. All will be submitted formally in the comment period. It now appears fortuitous that Congress could not reach a compromise on drug AIDC. Hopefully, pharma can get behind the UDI approach. Should GS-1 cease their country-by-country and GPO lobbying to have one and only one system, that would facilitate harmonization. Then, industry can assess the costs and benefits of the systems available under the UDI proposed rulemaking. Looking forward to finally meeting you in Orlando. Note: I am no longer on the HIBCC BoD. I have financial interests in IP related to the use of AIDC.